Low vision in the elderly is a common problem, as our eyes undergo different changes over time. For the most part, many vision problems can be corrected with glasses or contact lenses, but if these can’t help, then surgery may be required. Even if corrections have been made to your vision, and it still isn’t 20/20, this is known as low vision. Low vision is when a person uses corrective devices or has undergone surgery to correct their vision and yet still reports difficulties performing daily tasks such as reading the mail or signing their name. Those over the age of 65 are at the highest risk for low vision, and the risk is higher among individuals with diabetes or glaucoma. Types of low vision include loss of central vision, loss of peripheral vision, night blindness, blurred vision, and hazy vision. Common causes of the many types of low vision include cataracts, macular degeneration, diabetic retinopathy, glaucoma, retinitis pigmentosa, and light sensitivity. Even heredity and eye injuries can lead to low vision. If these symptoms are not corrected with glasses, contact lenses, or eye surgery, then they indicate low vision. An eye exam can help diagnose low vision, so if you begin to experience changes in your vision, you should see your eye doctor. It’s also important to keep up with regular appointments with your eye doctor to ensure that changes in your vision are well-tracked, especially if it is caused by an underlying eye condition. Treatment depends on the cause of low vision. For example, if low vision is a result of diabetic retinopathy, treating diabetes may help restore or maintain proper vision. If diabetic retinopathy cannot be treated, then it can result in permanent low vision. Other treatment options for low vision include telescopic glasses, lenses that filter light, magnifying glasses, handheld and freestanding magnifiers, closed-circuit television/video magnification, and reading prisms. Non-optical aids that can help improve low vision and aid in your daily functioning include text-reading software, check writing guides, high contrast watches and clocks, talking watches and clocks, large-print publications, clocks, phones, and watches with larger numbers, and books on DVD or audio devices. Low vision can be problematic as it impairs your ability to see certain things, which can impede your ability to perform everyday tasks. It’s important to use visual aids as listed in the previous section to help you improve daily function and make your daily life easier. 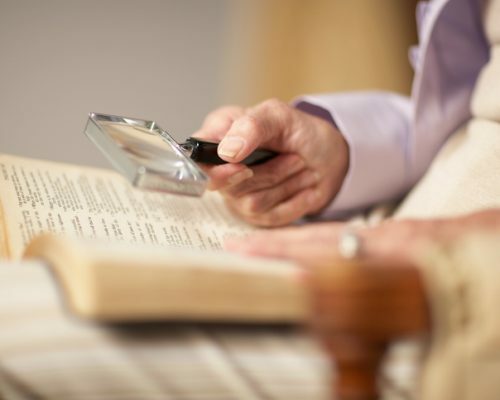 Some general rules when living with low vision are make things brighter with more light or closer light, make things bigger with a magnifier, be well organized so you don’t have to search for things you need, label items clearly, and continue to participate in activities you love instead of isolating yourself. Social isolation can have a negative effect on your overall well-being. There are plenty of new technologies available that can aid in your low vision and make daily tasks easier to complete. This way, you can still enjoy your life and not let low vision affect your happiness.